Parliamentary elections were held in Iceland on 29 October. They had been planned for next spring, but were brought forward after protesters forced the resignation of the prime minister, Sigmundur Gunnlaugsson, in April. He and his wife, along with the finance and interior ministers, were implicated in the Panama Papers. Both Gunnlaugsson’s Progressive Party and its coalition partner, the conservative Independence Party, were embroiled in the scandal. Consequently, much was expected of both the Pirate Party – who were polling 43 per cent in April – and the Left-Green Movement in last month’s election. And both did well, winning 10 seats each, the Pirates tripling their share of the popular vote and the Left-Greens finishing second. But the Independence Party came first, with 21 of the Althing’s 63 seats, in a position to form a government. Such an outcome should be surprising, given the Independence Party was widely viewed as culpable for the mess the country found itself in only eight years ago. Yet across Europe, parties of the centre-right are proving resilient in an age of increasingly populist sentiment. Spain’s Partido Popular saw its vote share rise in June’s general election, despite 20 per cent unemployment. In Ireland, ordered was restored in February’s elections with Fine Gael and Fianna Fail finishing first and second. Theresa May’s Tories are polling 40 per cent in Britain, where wages have fallen by more than 10 per cent in nine years and nearly 17 million people of working age have savings of less than a hundred pounds. Greece may look like an exception, with a government led by Syriza, but New Democracy, the traditional conservative party, remains second. Pasok, the historic party of Greek social democracy, won only 6 per cent in last September’s election. In 2009 they won 44 per cent. Pasok’s decline is a case in point. While parties of the centre-right have either survived or thrived in the years since the global financial crisis, parties of the centre-left have in many places collapsed. Iceland’s Social Democratic Alliance, like Pasok, came first in a national election as recently as 2009, claiming just under a third of the vote. On Saturday they received less than 6 per cent, winning just three seats. In 2014 I met Reykjavik’s new Social Democrat mayor, Dagur Eggertsson. I asked him if he thought that the rise of his predecessor, the comedian Jon Gnarr, masked a broader political shift, not just in Iceland but across Europe. Parties of the centre left, I suggested, were confronted with a simple choice: change or die. Eggertsson – pragmatic, calm, technocratically minded – was inclined to disagree. Now, his party finds itself the seventh in the Althing, with three parties founded since the crisis sitting above it. That is not to say that parties of the radical left have all the answers. Indeed, just as conservative parties have consolidated since the crisis, and progressive parties have declined, the insurgent parties of the left – Iceland’s Left-Greens, Podemos in Spain, Sinn Féin in Ireland, Corbyn’s Labour – appear unable to mobilise the kinds of social majority that have historically furnished centre-left parties with power. Given the rise of Trump and the ascendancy of authoritarian politics, that is a problem. Pasokification, the demise of a managerialist left politics in the face of populisms on both the left and the right, has meant that in many countries the dominant elements of the left are, often for the first time, explicitly socialist. The question confronting these newly prominent players is how to win power in a context of permanent austerity, where the centre right does surprisingly well by shifting from the centre; how to persuade a majority, as social democracy once did, that continuity has little to offer and radical change isn’t just preferable but pragmatic. Iceland’s results confirm something we already knew: unveiling corruption and punishing an elite is not enough; to win, you need to offer an alternative – both rationally and emotionally. This is too broad a sweep to help us further. I don't think that the situation in Iceland is analogous to the countries in Europe with large traditional social democratic movements. The all-conquering doctrine of liberal capitalism, the liquidation of the old strongholds of labour as heavy industry in Europe disappears, the control by lobbyists of the machinery of power have all contributed to the collapse of the working class as a political force in Germany, France, Italy and Britain. As the belief in the 'free market economy' has taken hold the chances of victory for a socialist party in Europe have dramatically declined. And if we look at China or Russia - both galloping command capitalist economies - we can see where that kind of authority would lead us. I don't like to think about what will happen during the next twelve months, with important elections in Germany and France, where reactionary parties are crowing with pleasure over Trump's victory. Whose votes do you think have helped UKIP, Le Front National and Donald Trump to their recent electoral successes? Take a look at the strength of the labour movements in the sixties in Germany Italy and France and you will see what I mean. The Unions in Germany struck for and got a 19% wage increase in the late sixties. The point is I think what exactly does "working class" mean? Much of the working class is now the lumpenproletariat, as the accelerating pace of the replacement of workers with machines continues. So it might be many of the same people, but they're not really "working class" anymore, the class issues are different. That's I guess the point, the center left can't really address this, the wanna be fascists can, and real leftists can. Aaron Bastani asks what now for the left, as if the left had suffered a setback in Clinton's defeat. It didn't because Clinton had never had anything to do with the left. Hillary is on the left - in the sense that silicon valley and Wall St are perhaps vaguely to the left of big oil and the gun lobby. Comparing the US Democrats with PASOK is a nonsense: Clinton won the popular vote despite being a very weak candidate - Joe Biden would have surely trounced Trump. Social democracy in Europe faces two severe problems: (1) how to adopt even moderately successful/desirable economic and social policies in a context of austerity (2) how to deal with the fact that a plurality (possibly a majority in some countries) of its core lower to middle income voters want substantially less immigration. (2) can actually be solved relatively easily: stand up to the zealots like Bastani, insist that its not remotely racist to want to limit/ control immigration, and adopt some sensible policies which rebuild trust. Unfortunately, in the UK it seems like Labour is going to speak for the 5-10% of the population who want higher immigration when immigration is the first or second priority for voters. To top it all off, many pro-immigrant are affluent city types who will never vote for a leftie like Corbyn. Ah, controls on immigration—if only one of Europe's centre-left parties had thought of promising that before! Such a pity that there was never any talk of controlling immigration under Blair or Brown; no Labour politician ever spoke about Britain being 'swamped' by immigrants, did they? Oh wait, they did: http://news.bbc.co.uk/1/hi/uk_politics/1949863.stm. 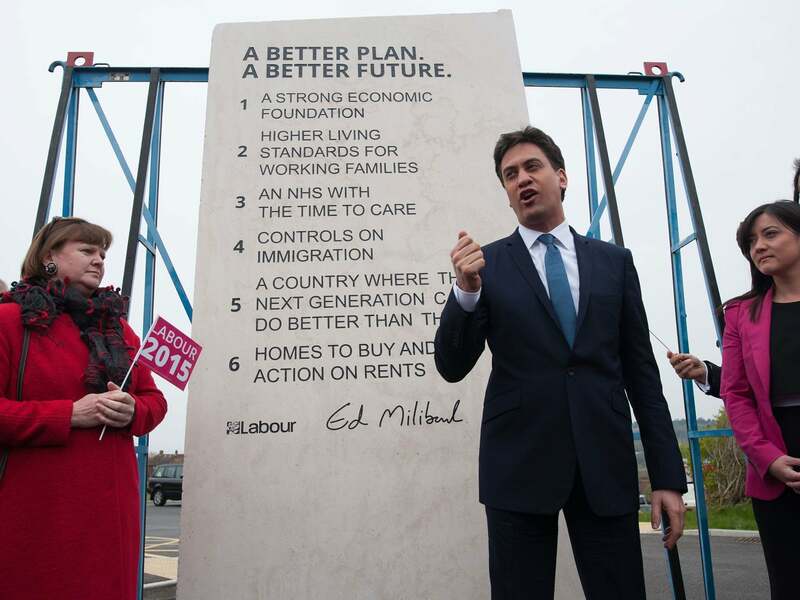 But that sensible approach was discarded under Miliband, wasn't it—if only someone had suggested that they make a mug promising 'controls on immigration', or carve that pledge into a tablet of stone ... oh wait, they did: https://static.independent.co.uk/s3fs-public/thumbnails/image/2015/05/06/12/labour-ed-miliband-stone-v2.jpg. Labour's strategy under Blair and Brown was to talk tough on immigration (and direct various nasty petty measures at asylum seekers) while allowing it to continue for its economic benefits. Like a lot of New Labour policies, this approach worked in the short term. But in the long term, by giving people the impression that their concerns about immigration were justified and then not addressing them, it merely stored up ever greater public resentment - until now we find ourselves in a situation where people are so busy whining that "you're not allowed to discuss immigration" that it's become difficult to discuss anything else. At this point the Labour party faces a choice. Endlessly reassuring people that Labour understands and shares their concerns (the approach favoured by Ed Miliband) clearly doesn't work. So either they must set out to actually do what anti-immigration voters want (which means accepting a hard Brexit and all that entails), or they must, like the SNP, find a message sufficiently compelling to overcome the current national obsession with migrants and move the conversation on to something else. The latter approach will be hard and will take time, but it's probably the only feasible option left.